Pakistan’s government has called for troops to be deployed in the capital, Islamabad after violence broke out during protests by Islamists. About 200 people were injured earlier when security forces tried to disperse an Islamist sit-in at the Faizabad Interchange – a key highway. That operation has now been suspended. 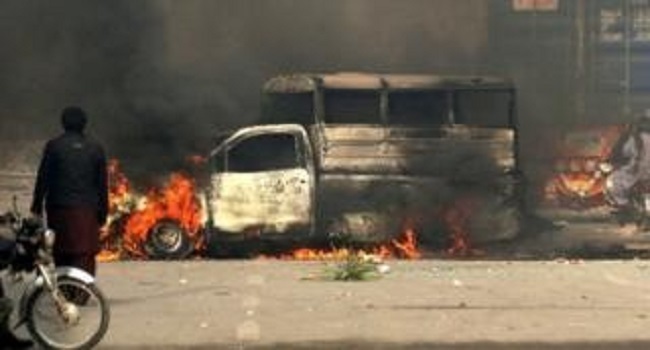 Pakistani media report that demonstrators also broke into the minister’s residence in Punjab province. Mr Hamid and his family were not in the building. The protests have spread to other cities, including the southern port of Karachi. The Pakistani government authorised the deployment of the army in Islamabad on Saturday evening. The interior minister said the order was issued at the request of the city authorities. Earlier on Saturday, security forces used tear gas and rubber bullets to try to disperse the demonstrators, Pakistani media report, but were met with rocks and tear gas shells. About 8,500 elite police and paramilitary forces took part in the operation to clear the Faizabad Interchange. The request for the military deployment came after hundreds of more demonstrators turned up unexpectedly forcing the police to retreat. There was no immediate comment from the Pakistani military.